Southern California is dense with bars, gastropubs, speakeasies, lounges and taverns. 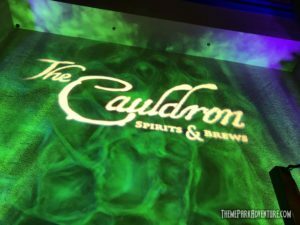 However, no one has quite seen anything like The Cauldron Spirits & Brews, which has officially opened in Buena Park, directly across the street from Knott’s Berry Farm. A long-time dream of owner Lara Hanneman, The Cauldron is unique in that it’s an upscale bar setting wrapped up in an environment one would expect to find in a haunted house maze at Knott’s Scary Farm. That’s no surprise, as Lara worked at Knott’s for over two decades, ultimately becoming the park’s Creative Director, overseeing all aspects of Halloween Haunt and the property in general throughout the years. For Haunt fans, it is a familiar environment – like stepping inside the event’s now-famous Trick or Treat maze for the evening to enjoy cocktails and food. For guests not familiar with Lara’s past or Knott’s Scary Farm, it’s a walk on the slightly spooky side – without any gore or anyone jumping out of the shadows; it’s a moody, dimly-lit immersive experience that speaks to all ages. Sinister Pointe, a company that is renowned throughout Southern California and beyond for its highly-detailed, interactive haunt attractions. This past summer, Sinister Pointe thrilled fans at Midsummer Scream by announcing that they would be unleashing a new kind of terror for the 2016 Halloween season: a walk-through experience called Fear the Mark. In 2015, Sinister Pointe produced an escape room type of attraction, rather than the traditional walk-through experience they’re most known and loved for; it was fun and well-executed, but definitely was a big departure from the type of haunt the company had produced for years. The announcement that the group was returning to its walk-through roots was very well-received by everyone in the haunt community. Knowing what Sinister Pointe is capable of, and understanding the creative need to move forward and try new things, we were very curious and excited as well to see what Jeff Schiefelbein and his team were going to bring to the table for 2016. This month’s TPA Halloween Mixer will be held Sunday, October 12th, on the patio between Trader Sam’s Enchanted Tiki Bar and Tangaroa Terrace at the Disneyland Hotel beginning at 7 P.M. As usual, we will have free buttons to give the first 30 TPAers on hand, and we’ll hold our monthly raffle at approximately 9 P.M. It will be a fun-filled evening of networking, great food, tantalizing tiki drinks, and yes… candy! It is Halloween, after all! Once we’ve raffled off some ghoulish gifts, the tiki torches will dim, and a dark force will flow over the gathering. For those interested, we have a special trick-or-treat in store! At approximately 9:30 P.M., we will depart Trader Sam’s and regroup in Fullerton (just a short drive from The Disneyland Resort) at Sinister Pointe Haunted Attraction. At a discounted rate of $15 per person, TPAers will not only get to experience Sinister Pointe’s terrifying 2014 experience, Beyond The Mirror, but once everyone has made it through, our group will get an exclusive lights-on tour of the attraction, followed by a Q&A with Jeff Schiefelbein and the rest of the crew! For years, Sinister Pointe Productions has been a major force in the Southern California haunted attraction industry. Owner Jeff Schiefelbein and his team of incredibly talented creatives have taken the art of haunting to new levels, featuring bold and innovative past experiences based on popular franchises such as Saw and Silent Hill. Sinister Pointe is also known for unique, highly-interactive ventures such as Fear, and its extremely over-the-top seasonal adult-themed Not So Very Merry Holiday Haunt. 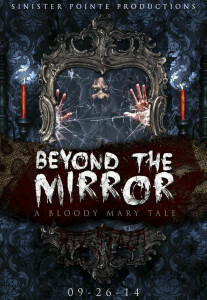 For the 2014 Halloween season, Sinister Pointe presents an all-new exercise in terror: Beyond the Mirror! A Bloody Mary Tale. Theme Park Adventure discussed this new venture with Sinister Pointe’s Jeff Schiefelbein, as we wanted to learn more details and share some exclusive information with our readers, who are eagerly awaiting their chance to experience Beyond the Mirror! Jeff acknowledges that the theme of Bloody Mary is nothing new to the haunt industry; it has manifested in many attractions around the united states for years, from Trapped at Knott’s Scary Farm, to Halloween Horror Nights at Universal Orlando, and at smaller haunts everywhere in between. The more Jeff pondered the lore and idea of Bloody Mary, he realized that while most haunted attractions focused on the actual character itself, none of them had really explored the world beyond the mirror – the ghostly, terrifying realm that the vengeful spirit dwells in; that is what he focused on, and that is what Sinister Pointe’s experience will explore in nerve-shattering detail. It’s an exciting revelation, and we agree that it’s a fantastic way to take an existing character and the mythology surrounding it, and making a unique experience faithful to the Sinister Pointe brand. Winter Nights 2 Brings Huge Crowd! On Sunday, January 19th, Theme Park Adventure held it’s first monthly mixer of 2014 – Winter Nights at Sam’s 2. To our great surprise, not only did we have a very good turnout for the event – we had a huge turnout, rivaling the biggest mixer we’ve had to date, which happened in November 2013! 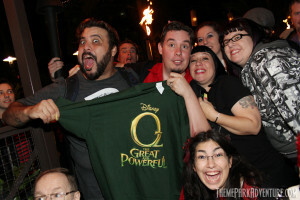 We didn’t bother with a final count, but by 10 p.m., well over 100 TPAers were mingling, eating and drinking on the patio outside of Tangaroa Terrace and Trader Sam’s at the Disneyland Hotel!